Is there anything else I'll need to get it running? Also any advice or recommendations would be helpful, thank you. Nice find, the frame still seems to be in pretty good shape.... Indeed you need a new pullstarter, starter catch (pawl), and probably a starter bolt.... I would go over all the bolts, make sure they're tight, lube the chain, clean out the old gas tank, clean the carb, look for a fuel line kit at a lawn mower shop, possibly a carb rebuild kit...... As for replacing the key switch, instead you can take the wires coming from the engine and plug the end into the wires coming from the throttle twist grip housing and use the button as a key switch..... Welcome to the forum and good luck! Welcome aboard, nice find, how much did you pay?? Well, you have no way to start it. It will run on its own, gut the starter/generator, break the magnets out of the housing. Take the wiring and stuff off the center shaft. You want an empty house and a shaft with a starter pawl and starter cover w/ rope, and an M8, 8mm nut to hold the pawl on the shaft. There are 2 kinds, I like the round pawl w/ Moon cover w/ 2 steel pins. If you get an 8mm x 1.25 nut and maybe washer you could put the nut on the shaft and use an air or electric drill to turn the engine over to see if it run. Open up the carb piston w/ the throttle cam on top, put a little 2 stroke gas down the carb, hit it quick with the drill, see what happens. 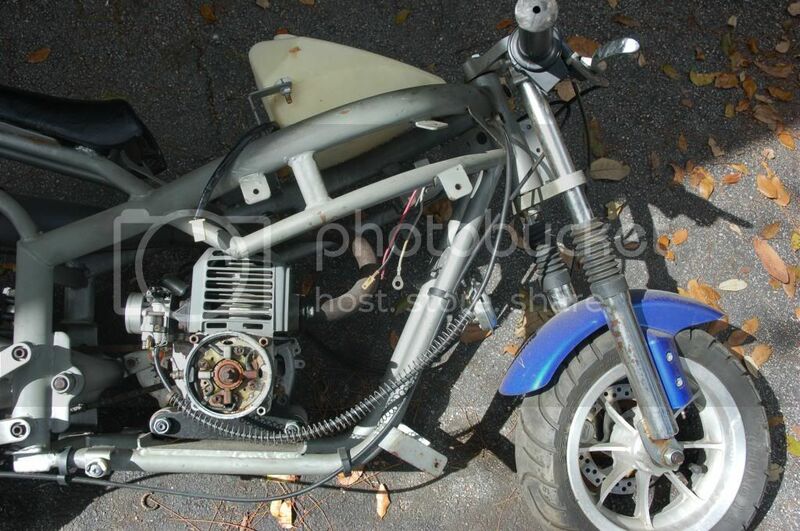 Parts are pretty cheap on eBay, look under 43, 49cc pocket bike parts, or X7 PB Parts. There is SP4Less and PB Parts in Florida that have parts. On the world wide web scooterparts4less and pocketbikeparts both with a .com on the end. Have fun. Last edited by EPR; 02-26-2014 at 07:41 PM. There is a way you can jump-start the engine off a car battery.... But I wouldn't recommend it unless you don't mind going through the process EPR stated by gutting the e-starter afterwards.... On second thought, probably couldn't hurt to try, looks pretty rusted up in there, lol. 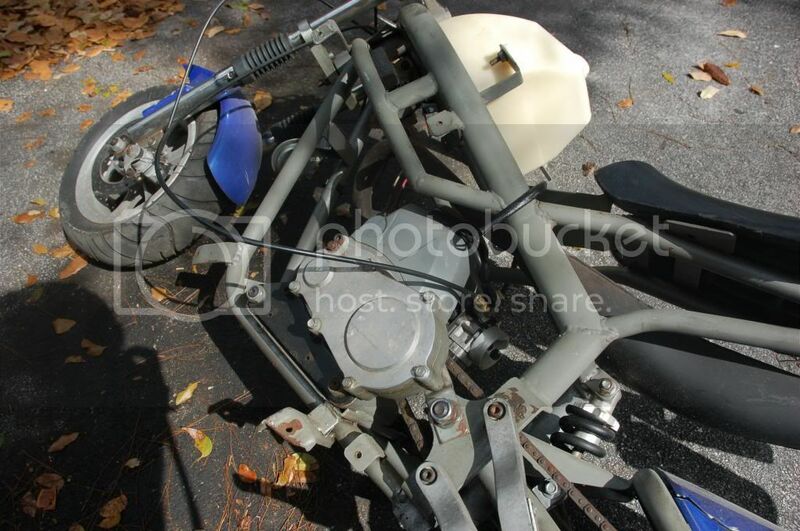 That bike needs a return line from the carb back to the gastank...Yours seems to be busted and removed.............You can get a fuelline kit from HomeDepot. How do we know the brushes even work?? I believe 2 brushes start the engine and when the engine is running the other 2 charge the battery thru the ac/dc wire box. Don't look like you have any lights?? With a starter you need a new battery and a charger and so on. First, I would see if it runs. Thanks for all the advice! I pulled apart the engine and discovered it needed a new flywheel so I'm in the process of replacing that and all the gaskets and cleaning the inside of the engine. I already found some of the parts websites through my searches of the site but I ordered the pull start and starter pawl that don't fit together so I reordered the parts that do fit. I only paid $20 for it but I can see this can get expensive fast! Haha I'm not actually worried about the electric start because the entire electrical system including the start button is missing, so I'll probably end up gutting it. I'm hoping to have the engine back together by this weekend and then I'll start rebuilding the carb and re-greasing the transmission. What oil will I need to put in the transmission though? That's not a transmission it is a 3 to 1 reduction box, it's there to gear down the engine rpms and to get the outer trans 8mm gear back so when the rear arms go up & down the chain don't rub on the front of the arms. I put bearing grease on the inner chain and gears. You might be able to clean everything on the chain & in the box, put 100cc of 20wt. oil and seal the cover back on with gasket maker, CAM2 would know. Reviving a looong dead thread in hopes of getting this bike running again. To give a very brief update, I picked the bike up in high school as a fun project. After investing a lot of time and way too much money in it, the bike fired but didn't run, then broke the pull start. I got frustrated and put it to the side. In the time since, I've finished college and finally have enough time, space, and patience (hopefully) to get it running. 1) When I got it, the flywheel was broken. I replaced it, got the bike to fire, then let it sit. I can't get a spark now and it appears the flywheel has demagnetized. Is there a way to re-magnitize it or should I just replace it? Additionally, is there a way to test the magneto? I have good resistance between the high tension lead and then body but I wasn't sure if there were additional connections that could be tested. 2) I gutted the electric start and now just have the threaded end of the crankshaft coming out of the engine. Can I just put a nut or two on the end and spin it with a drill to start? If so, does anyone know the thread pitch of the nut I would need? I'm tempted to just get a new engine, but I would much rather have the satisfaction of repairing what I have. I don't know how you mounted the flywheel to a smaller diameter nub but it looks all wrong..Does the crank have the same threaded end on both sides….? Heres a picture of a stock crank..notice the smaller diameter crank journal. When mounted right they look like this when the pullstarter and pawl are removed...…..
Last edited by CAM2; 1 Week Ago at 12:01 AM. Yeah, I bought one of them 42.5mm cyld, sold as a 49cc, from PCC motors years back, I was not happy, but I put a Boosted306 ported 44mm modified cyld on it any way, so it was no biggie. I would think seriously about a new engine. For about $129 you can find a pull start only engine, no generator housing. Save that engine for parts. I am working on a 43cc engine with a Cag full circle crank modified to fit the small seal side. Using a CAM2 43cc chopped and ported and modified cyld and a gold alum alloy Cag hp head. 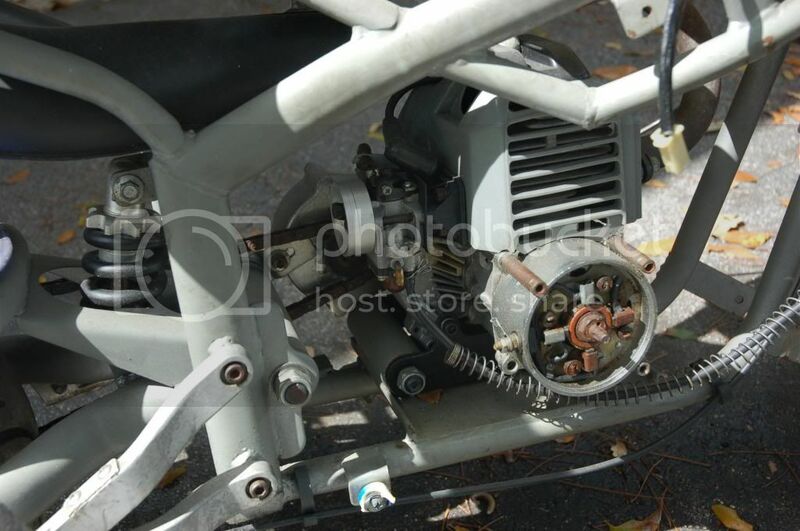 Like this 49cc piston port engine. Last edited by EPR; 1 Week Ago at 10:24 PM. Yep thats what I was thinking too.. Doing something like you did to your 46cc engine..
Last edited by CAM2; 1 Week Ago at 12:50 AM. Yes, I would look at all options. Add up parts needed to make it run right compared to a new engine. SP4less might carry a ported 44mm piston port cyld, I saw one somewhere a few months ago. PBU way back had $800 racing P/P engines. I saw topend kits going for $23.00 shipped and seals for $10..
Best part of it all is he would gain firsthand knowledge and have had done it on his own merits..
Well unfortunately, I think you guys are right. After looking at the engine again, it looks like the last person who tried to work on it had less of an idea than me! As far as I can tell, not only did they put the crankshaft in backwards but they cut threads into the starter side of the crankshaft to thread a nut that now holds on the flywheel. I have a feeling that between tearing the engine completely down, replacing the crankshaft, flywheel, pull starter, top end, seals, etc, I would probably be better of getting a new engine. Especially since I have no idea if this engine will even run well. I could always port and polish a new engine. Last edited by CAM2; 1 Week Ago at 09:48 PM. You have one of the few generator housing units with the brushes up front. It has stand offs on top to hold the outer alum ring I believe. SP4Less don't show that ring. might be hard to find.